Happy Anniversary ICD-10! Happy Anniversary ICD-10! 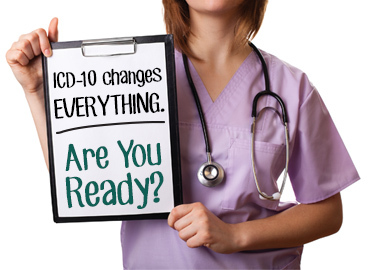 Gearing up for the switch from ICD-9 to ICD-10 last October, many providers expected nothing but headaches. The new system increased the number of diagnostic codes from around 13,000 to about 68,000, requiring clinicians to sift through highly specified conditions — and some unusual ones, such as W61-62XD: struck by duck. But after a year of using the ICD-10 — and the impending end of a one-year grace period that ensured providers wouldn’t be denied Medicare Part B claims as long as they used a code from the correct family — most physicians say the implementation process went better than expected. “The fear that this was really going to impact us financially because of the potential inability to process the new codes really never transpired,” says Michael Munger, a family physician with Saint Luke’s Medical Group in Overland Park, KS, and president-elect of the American Academy of Family Physicians. In fact, the error rate for claims tracked by the AAFP was the same this year as it was for ICD-9 — 10%. The fact that commercial insurers didn’t have the grace period bodes well for the loss of flexibilities, since doctors should be used to being more specified in their claims. The American Medical Association, which pressured CMS to allow the one-year grace period, agrees that it worked well with no major uptick in Medicare claims rejections. The group added that it continues to monitor for potential disruptions or changes that could result when more specific coding is required at the end of the year. To help providers understand what to expect going forward, CMS has updated its question and answer page on ICD-10 flexibilities. It stresses that providers should already be coding to the highest level of specificity and check the coding on each claim to make sure it aligns with the clinical documentation. Unspecified claims will be accepted where appropriate, such as a diagnosis of pneumonia when the specific type hasn’t been confirmed. CMS resources also include a list of contacts on ICD-10, as well as the 2017 ICD-10-CM diagnosis code set and related guidance and the 2017 ICD-10-PCS inpatient procedure code set and guidance. While the initial implementation of ICD-10 went relatively smoothly, there were some challenges, particularly around workflows within the electronic health record. For example, type 2 diabetes is no longer type 2 diabetes. Providers now must scroll through some 40 options to find type 2 diabetes, says Munger. Most EHR vendors have been alerting their customers to the end of flexibilities and are putting new workflows in place, allowing provider time to prepare for the change. Munger says his practice recently upgraded its EHR to account for even greater specificity in coding starting Oct. 1. The bigger problem with ICD-10 is that diagnostic codes are still tied to a FFS billing structure. Richard Bruno, a resident in a combined family medicine-preventive medicine program in Baltimore, MD, and an AAFP board member, agrees. “The challenge has been with the transition, especially within the medical records system, using the electronic health record and making sure that it’s searchable and that the right codes are associated with the right people, as these are tied to payment,” he tells Healthcare Dive. Working closely with an EHR vendor can help smooth that transition, he says. The bigger problem, he says, is diagnostic codes are still tied to a fee-for-service billing structure that rewards doctors for getting more detailed in their diagnoses. Hopefully, with the shift to value-based care, “we’ll start to move to other types of payment structures that are not so impingent upon getting accurate diagnostic codes,” Bruno says. While the Centers for Disease Control and Prevention and the committee that governs ICD-10 could provide more guidance on causation codes, it’s not a priority, given that they are still sorting out the injury and illness codes, she notes. Cardiology alone added more than 3,000 codes this year.